Just when we thought we were done with the Sexyblogger fad, I found this one on the South China Morning Post dated 21 Apr 2005. 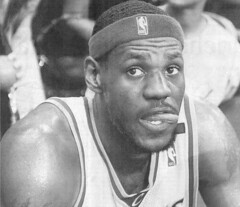 That's LeBron James of the Cleveland Cavaliers (NBA). yuck! look like a cigar to me.